Ever feel like a dessert to satisfy a cold weather craving? 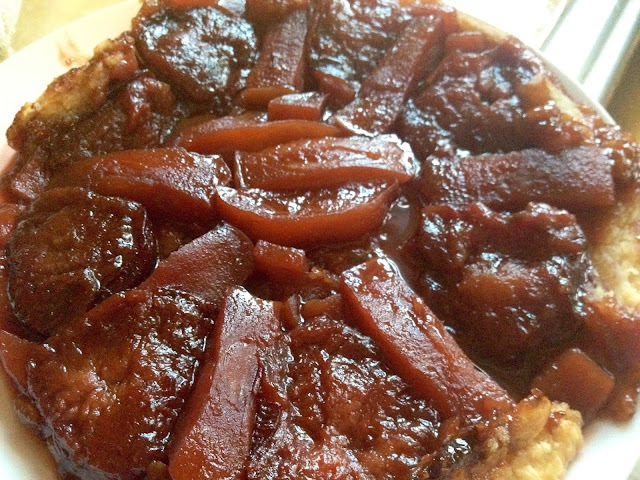 The classic tart tatin is beautifully rustic. Now enter plums, just cause they were on my counter top and I love their tartness in dessert. In an oven safe, cast iron or stainless steel pan on medium high heat, add sugar and butter. Mix once the butter is melted and let cook for about 5-6 minutes, add in your plums and apples and lower the heat. Cook for about 15 minutes. With apples only, I usually turn them half way through the cooking, but I didn't with this tart. There was plenty of juice so I didn't think it was necessary. Preheat oven to 385F. Remove pan from heat. Cover top of apples/plums with pie crust. Try to carefully tuck it down around the apples/plums. Place pan into the preheated oven for about 20-30 minutes, until the crust is golden brown. Remove pan from oven. Let stand for 5 minutes. Take a heat proof plate and place on top of the pan, and flip the pan over leaving the tart in your plate (hopefully).